Gibb's Farm is a working Farm located on the forested slopes of the Ngorongoro Conservation Area. It comprises a warm and friendly community where the rhythm of Farm Life has calmed and restored the weary safari journeyer for over 40 years. Gibb's Farm hugs nearly a mile of the Ngorongoro Conservation Area, part of a 3,200 square mile reserve. Ideally located, the Farm lies half way between Lake Manyara and the Ngorongoro Crater, near the village of Karatu. The area between Gibb's Farm and the Ngorongoro Crater Rim (up to 7,600 feet elevation) is heavily forested and inhabited by unique wildlife and plant life. The Farm’s bird list boasts nearly 250 species. Gibb's Farm provides a welcome stay on any safari, and a base from which to enjoy the many activities available in the foothills of the Ngorongoro Forest, The Ngorongoro Crater and Manyara National Park. Even if your stay is short, find time for a gentle walk or a tour of our gardens. Among the oldest guesthouses in Northern Tanzania, Gibb's Farm is a grand old dame. The old colonial farmhouse, built by German settlers in 1929, remains a charming, well-looked-after-private house with roaring fires and friendly hospitality. Extensive coffee fields, a dairy, pig farm and 10 acre vegetable, fruit & herb gardens surround the Farmhouse and intimate cluster of cottages Gibb's Farm is committed to using only sustainable, organic farming methods. Farm-style meals, afternoon tea and walks through the lush floral gardens and farm have calmed and restored international travelers for over 40 years. The African Living Spa® experience is a complete sensory journey. Based on Maasai traditional medicine, unique treatments for travelers are developed at Gibb's Farm. Hiking, mountain biking and canoeing with a trained naturalist are among the many adventures available at Gibb's Farm. Set among formal English gardens, the Farmhouse and 20 en-suite cottages are the heart of a working farm. Built in 1929, the Farmhouse has hardly changed, retaining the charm of a well looked-after private house. Cozy living rooms and reading corners are just steps away from the dining room, bar and gift shop. Fireplaces fill the Farmhouse with warmth and historical charm. Just outside, a sprawling verandah and floral garden invite sweeping views of the valley below the Farm. Organic Coffee is grown, processed and roasted on the Farm, and a vast 10-acre organic fruit and vegetable garden provides 90% of the ingredients needed for fresh, home-cooked meals. The main facilities, consisting of a living room, reading room, dining room, bar and gift shop, are situated in the old Farmhouse. Originally built in 1929, the Farmhouse retains her character of a well-looked-after private house with roaring fires and friendly hospitality.The Farmhouse patio sprawls into lush, vivid, gardens with sweeping views of the valley and beyond. Tucked inside the 80-year-old farmhouse are intimate living rooms, cozy reading corners, and inviting fireplaces - just steps away from the dining room, coffee roasting area, library, bar and gift shop. Farm-style meals, fresh from the Farm, are served daily in the Farmhouse Dining Room. The patio and front garden area share sweeping views of the valley and surrounding escarpment hills. The Farm’s original chill room (from the cool waters of the Ngorongoro forest) was long ago transformed into a cozy living room. The front living room has hardly changed in 80 years. The Farm’s old knitting room was recently transformed into a library and reading room. Outside the library, a charming patio sprawls into the lush floral garden, providing sweeping views of the coffee farm and valley beyond. Featuring select books, textiles, decorative art and jewelry, the Gift Shop offers quality memories from Gibb's Farm and Tanzania. Gibb's Farm's organic fruit and vegetable garden provides the ingredients needed for three healthy, fresh home-cooked meals a day. Start your day with a cup of freshly roasted Gibb's Farm coffee; move onto a wide buffet selection of fresh fruit, fresh juice, yogurt and homemade granola and muffins; and top it off with a hot cooked plate of fresh eggs, bacon, sausage and pancakes served at your table. The creative Chef Kuntal plans all the menus according to the Farm’s seasons. Almost all ingredients are fresh from the Farm estate gardens. Our famous Farm-Style buffet lunch includes wood-oven baked bread, a soup, a wide selection of savory meat and vegetable pies, quiches, fresh and creative salads as well as a few traditional African dishes. Save room for Gibb's Farm legendary rhubarb crumble, chocolate mousse, rice pudding and chocolate pudding. For dinner, a four-course meal is served at your table. The 18 newly completed Farm Cottages mark the beginning of a new era for Gibb's Farm. Farm Cottages each have a name, chosen for the cottage’s particular location or specific history. Artwork commissioned specially for each theme, and created at the Farm by Gibb's Farm Artists-in-Residence, embellish the walls and gardens. Cottages feature rich wooden floors and classic interiors, with panoramic wraparound windows. From the private verandahs, the gardens, vegetable farm and Ngorongoro Forest may be viewed. En suite Garden bathrooms have both indoor and outdoor showers, a generous bathtub to soak away safari dust and fatigue, twin hand basins and a separate w.c. A wraparound fireplace heats the bathroom and living area. Gibb's Farm today consists of 30 Acres of quality organic coffee, 10 acres of organic vegetables and fruit, 5 acres of flowers and herbs and a working dairy and pig farm. There is also a tree nursery on the Farm where hundreds of young saplings are grown to encourage the growth of native tree species in the area. The entire operation is a model of ecologically sustainable agriculture. Everything is grown organically using only natural fertilizer from the farm. Farm Manager Petro uses plants with insect repellent properties instead of pesticides to ensure that no chemicals are added to the vegetables. Reclaimed water is used whenever possible. All buildings and furniture are built using local materials and local labor, at our on-site workshop. All bottles are broken down and recycled, or used in building foundations. 90% of our hot water is heated using solar power. In short, every possible element of Gibb's Farm is ecologically friendly and sustainable. • 90% of the food served at the table is grown at Gibb's Farm. We have 10 acres of vegetables and fruit, 5 acres of flowers and herbs, and a working dairy and pig farm. • We grow, harvest, process, roast and serve organic coffee. • We have a tree nursery where we nurture hundreds of young tree saplings, to encourage the growth of native species. • 90% of our hot water is heated using solar power. • All of our crops are grown organically, without chemicals or pesticides. Reclaimed water is used whenever possible. • All glass bottles are broken down and recycled, or used in building foundations. • We make everything we possibly can on site, using local materials and local labor. This includes furniture. • Wine bottles are broken and used in building foundations; plastic bottles are decomposed by the sun prior to disposal. All of the guest rooms are built using local materials and labor, thus supporting the local economy. Gibb's Farm is very active in supporting the local schools, managing donations from guests and contributing to the management and planning of school improvement projects, such as the new Tloma Primary classroom recently completed. Find out more on the Karatu Education Fund web site. The view from The Farmhouse has been compared to the ‘Napa Valley of California’. Rows of cultivated coffee caress the East African valley below. With terraced flower gardens at your feet, ancient trees overhead and a grassy knoll set with chairs and low tea tables, the African sun descends into the valley, putting on a memorable show each evening. The quintessential English Tea: Gibb's Farm coffees and teas, accompanied by Farm-baked cake and tea biscuits. Choose your teatime spot: the Gardens, your personal verandah, The Library, The Lounge, or The Sitting Room. Or spend teatime at the staff teahouse in the vegetable garden. Horticulturist Lazaro supervises the care of hundreds of species of flora, and herb gardener Daudi tends to the aromatic herb garden. It is a tour through a natural history museum: many plants have been here since 1959, when Margaret Gibb, an avid gardener, planted the first seed. The 40-minute leisurely wander is truly a breath of fresh air. Farm Manager Petro Qwaridi appreciates your interest, although few come to Tanzania to see cows and pigs. Experience a real working Tanzanian Farm and try your hands at milking a cow on the Farm Walk. Explore our 10-acre fruit and vegetable garden, and learn about the sustainable farming methods used at Gibb’s Farm. Deep in the Farm’s private forest reserve live the Maasai that offer traditional medicine for the Farm’s community clinic and the African Living Spa ®. There they live among the young cows in a cluster of bomas which they helped to build and call Namyak (good luck). Tree branches shelter the dining area. The Maasai offer their fire cooked goat with the farmhouse kitchen’s dinner. Dinner with the Morani (warrior) affords a special opportunity to experience a unique culture and rejuvenate under the stars. Gibb's Farm has been cultivating coffee for decades. Guests are welcome to enjoy the delicious aroma of coffee roasting, daily at the Farmhouse. This is a one-to-two hour leisurely walk around the Farm’s neighboring village of Tloma: An intimate look into north Tanzanian village life. Gibb's Farm has been supporting Tloma Primary School for years. A visit to the school can easily be arranged for those who wish to meet school children and observe first-hand the challenges facing education in Tanzania today. Explore Tloma village by bike, foot or car - guided by your trained naturalist guide. Meet a local family and learn about Iraqw culture and traditional ways of life. Admire the women’s pot-making techniques, try your hand at pounding grain, and taste the local brew. On the way back, stop at the local ‘duka’ for a soda. Wander the streets and markets of Karatu, and take in the sights and sounds of 21st century small town Africa. The tour includes a visit to the market, local bar, hair salon and various other small businesses. Choose to go by mountain bike, on foot, or by car. Discover original East African Fine art through Sanaa, Gibb's Farm artist-in-residence program. Gibb's Farm brings in selected Fine artists from all over East Africa to live on the Farm and work on commission pieces for the Farm’s cottage walls and gardens. Meet some of East Africa’s most talented artists, watch them work and unearth some of the continent’s finest work. Ole Labiki Menyengera, Gibb's Farm Indigenous Maasai Healer, leads Medicinal Walks into Ngorongoro Forest. Commonly used in Tanzania to treat health problems, the plants described on the walk and other herbal medicines are used at Osero Forest Clinic, a facility established to provide health care treatments for guests and the employee community. Early evenings are a perfect time to reflect. Naturalists, Farm Managers and Indigenous Healers alternate doing presentations in the Farmhouse. Indigenous medicine, the history of Gibb's Farm, animal behavior, birds and flora are all possible topics for discussion. A time to share knowledge, ask questions, and meet the experts! Guided by a Gibb's Farm Naturalist & a Ranger from Ngorongoro Conservation Area, the Gibb's Farm to Ngorongoro Crater Rim Walking Safari is an exciting wilderness experience, only possible by leaving the vehicle and striking out on foot. Along the 6-7 hour walk, one traverses untouched forests and encounters unique plant life and rare birdlife. It’s an experience of a lifetime. This 2-hour walk covers the best of the Gibb’s Farm estate. Guided by a Gibb's Farm naturalist, trails meander into the valley to a waterfall, through dense forest pathways, coffee fields and village trails. Gibb’s Farm shares a border with Ngorongoro Conservation Area. Just inside the conservation area, a majestic waterfall beckons travelers to enjoy a light hike through the forest highlands. Along the way, experience the ‘elephant caves’: cave-like structures created by elephants digging up the earth to ingest the vitamin-rich soil. This soil also attracts other large animals like Buffalo, Bushbuck, Waterbuck, and Baboons. Currently, Gibb’s Farm is home to over 220 different species of birds, and avid birders are encouraged to contribute new sightings to our bird list. Many guests simply enjoy sitting in the gardens, binoculars trained on flowers and trees, or in the skies of the rolling valley below. However, personalized bird walks with a trained naturalist can also be arranged. A few employees love to run on the Farm and along the forest and village trails. If the high elevation is not bothersome, (5,700 feet) join in! A great way to see the village. Our naturalists offer biking tours for all levels of experience. Hit the trails: it’s a wonderful way to get out and see rural Tanzania! Leave the Farm after an early lunch and enjoy a guided afternoon game drive through our neighboring Lake Manyara National Park. End up at Hippo Pools for a glorious sunset, snacks and drinks included. Our naturalists guide canoeing trips along the shores of Lake Manyara. A true escape from reality, this peaceful 2-hour journey is an unforgettable experience. naturalists guide you through Manyara National Park, one guide sitting on the bonnet with a spotlight and the other driving slowly through the night. * There is an additional fee for the marked activities. There are healing secrets whose origins are lost in the mists of time, secrets known only to the traditional healers of the Maasai of Tanzania. Until now. Once reserved for the exclusive use of Maasai tribal members, these ancient medicines and treatments are being offered for the first time to travelers visiting Gibb's Farm, through the skills of our traditionally trained resident healers and their assistants. Allow yourself to be touched by the wisdom of the distant past through this truly African Living Spa experience. “Tajewu Ibiot - Injoo Kinjiunyeki - Inoto Emayani" - Be Well - be Healed - be at Peace. Osero healing incorporates 5 key Maasai wellness principles, each based upon a timeless interaction between their culture and the plants, minerals, and animals of the earth itself - all contributing their unique attributes to your healing experience. Drawing from over 50 different indigenous plant-based medicines, a team of traditionally trained healers, led by third generation Maasai healer Ole Labiki Menyegera, has developed a range of innovative remedies for travelers visiting Gibb’s Farm. After a consultation with the resident healer, health treatments are prescribed based on the individual needs of the traveler. Treatments chosen by the healer include Engorno Milk Massage, Floral Foot Soak, Olkaria Clay, Coffee Scrub, Oljingai Heat Revival, Olorien Hot Wood Treatment, and Maasai Massage. The African Living Spa’s highly personalized approach to alleviating individual wellness issues draws its healing energy from the world of nature. Local medicinal materials are freshly gathered, harvested, and prepared by hand, giving each treatment the added enhancement of the traditional healer’s personal energy and individualized attention. The Maasai are, from birth to death, immersed in a culture of holistic preventative medicine, and it is not uncommon for Maasai to reach the age of 100. Maasai traditional healing is based on a philosophy of caring: caring for children, land, and cattle to bring wellness, long life (Engishon), happiness and closeness to Engai (spirit-God). The African Living Spa experience carries each visitor into the essence of these core Maasai healing principles~ inspiring a healthy lifestyle that is cultivated with care and intention. Living Spa healing does not take place in a single structure with meandering treatment rooms. The Living Spa concept is rooted in the Osero Forest Clinic, a health facility established at Gibb’s Farm to provide both indigenous and Western allopathic health care for the Farm’s employees and their families. The Living Spa experience for travelers is amplified by the various places where guests can choose to have their treatments. Ranging from the farm cottage fireplace massage bed to the cow-skin on the floor of the indigenous healing hut, all are meaningful spaces in meditative environments. Treatments can be experienced in the blissful comfort of one ’s private farm cottage – a true Sanctuary for the Senses, in experientially designed indoor and outdoor spaces: by the cozy living room fireplace; on the verandah overlooking the Ngorongoro Forest; or in the garden vishy shower. Alternatively, one may choose to experience a truly indigenous healing session, in the traditional earthen and thatch Engishon Supat (House of Life), using only traditional methods and materials. or under the healing branches of the Oreteti Tree at the heart of the Ngorongoro Forest. After the treatment a light meal is offered in solitude, with medicinal teas specially prepared by the healer. Fill your senses with famous Gibb ’s Farm food, fresh from the farm, under the healing branches at the heart of the Ngorongoro Forest. The African Living Spa is a truly all-sensory journey, one steeped in the ancient traditions of East African restorative traditions – a memorable healing experience occurring in nature, with nature, naturally. Maasai healing is based on a philosophy of caring for all aspects of indigenous Life : children, cattle, sustenance, fire, fertility, and Spirit. The first lesson of responsibility a Maasai child learns is the tender care of the family cattle, which represent his sustenance and his family’s wealth. Through this discipline, Maasai children learn to embody honor, trust, and respect in all things. At the African Living Spa, we give our attention to the nourishment of both body and soul, through mindful care of that which is most valuable. Ocimum Suave tea, brewed fresh on the hearth during every treatment, is a natural detoxifying agent offered to clients following every African Living Spa treatment. Freshly extracted herbal oils are combined with local artesian well water for body and foot scrubs employing local volcanic pumice stone for soothing and softening skin as well as relieving tension and jet-lag. Milk oil is hand-churned in gourd calabashes daily from the Gibb's Farm dairy herd, and mixed with selected plant medicines to create a wondrously silken milk-based massage oil. Heated muslin-wrapped packets of fresh herbs steamed by an open fire and fire-warmed Olorien wood are skillfully used to relax and release muscle tensions, returning the body to balance. Olkaria red clay paint is hand-pounded and mixed with the rich emulsion of milk oil and plant medicines to revive the skin, improve circulation, and tone the skin. One of the riches of the volcanic slopes of Gibb's Farm is its robust and flavorful bounty of organic coffee beans. Fresh roasted and finely ground, these beans are blended with Olkaria clay to create a superb exfoliant and stimulating massage treatment. Experience the timeless healing power of the ancient Oreteti tree, as you consult with traditionally trained Maasai healers in the beauty and tranquility of the local forest. health care for Gibb's Farm’s 150 local employees and their families, as well as to develop indigenous healing treatments for The African Living Spa. The area around the nearby village of Karatu was cultivated as early as 2,000 years ago by the Mbulu or Iraqw, a Cushitic group of people who migrated south from Ethiopia and Yemen, and who still dominate the area today. The Maasai came fairly recently, in the late 1700's, but were driven into other areas more suitable for cattle herding by repeated wars with their agricultural neighbors, and by the sleeping sickness in their herds. The first European settlers to arrive were the Germans, in the late 1800s. After the First World War, Tanganyika became a British Protectorate. In the late 1920s a coffee farm was established by a German farmer, subsidized by the German Government. During the Second World War, the British Custodian of Enemy Property took over the Farm. Neglected through the war years, the Farm was bought in 1948 by James Gibb, a British war veteran, who returned it to production. In 1959, he married Margaret, who was born in Tanzania to British parents. Margaret, an avid gardener, started a small vegetable and flower garden on the property. In 1960, the Serengeti National Park was partitioned and the Ngorongoro Conservation Area was established along the northern boundary of Gibb’s Farm. 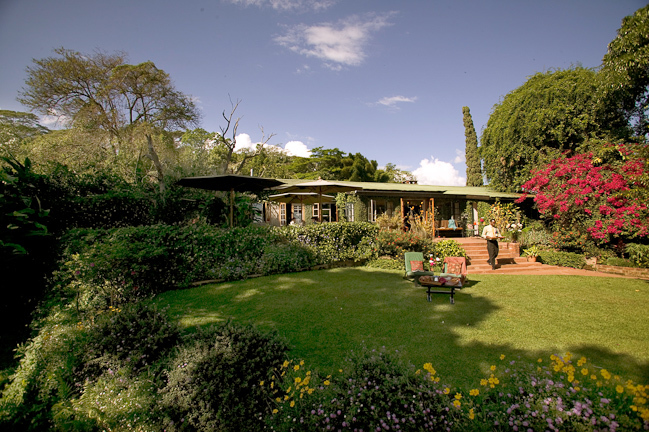 As more and more visitors became attracted to the Conservation Area and surrounding National Parks, James and Margaret built guest cottages in 1972, making Gibb’s Farm one of the first guesthouses in Northern Tanzania. James Gibb died in 1977, but Margaret Gibb continued to run Gibb’s Farm until 2003 when Margaret and her late husband Per Kullander passed on the Gibb’s Farm tradition to new investors - users of the lodge for the past 20 years. This is a new era in the history of Gibb’s Farm. Building on a Legacy, the Farm is currently undergoing major upgrades and improvements.